All attendees must be registered for the course by November 8, 2019. All attendees including, but not limited to, Agency Representatives, Health Care Professionals, Guests and Arthrex Corporate Employees are required to register. Please review tabs at the top of the registration page for more information on course fee inclusions such as transportation and accommodations, C.E. credit hours, location map, and registered attendees. If you do not receive a registration confirmation after you register, please check your spam/junk mailbox. 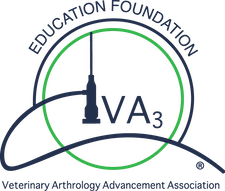 This course is presented by the VA3® veterinary association educational foundation, an educational partner of the American College of Veterinary Surgeons and is sponsored by Arthrex. It is designed for the 1st year surgical resident interested in developing fundamental arthroscopy skills. Residents will learn how to utilize arthroscopy skills-training tools such as the Arthrex ArthroBox® triangulation training system and progress to mentored hands-on arthroscopic surgery in cadaver elbow & shoulder joints. Training exercises covered in the course can be practiced at home to help advance eye hand coordination and visual triangulation skills. Didactic and cadaver wet lab sessions will focus on principles of triangulation, guidelines for consistent portal placement, familiarity with equipment and instrumentation along with fundamental joint anatomy of the canine elbow and shoulder. Following completion of this course, residents are encouraged to attend the Sr. Veterinary Resident Course: Arthroscopy and Open Joint Surgery for more in-depth coverage of the current procedures and techniques-related arthroscopy and joint surgery of the canine shoulder, elbow, hip and stifle. This program 287-34954 is approved by the AAVSB RACE to offer a total of _11_ CE Credits, with a maximum of _11_ CE Credits being available to any individual veterinarian or veterinary technician/technologist. This RACE approval is for the subject matter categories of: Surgical/Orthopedics using the delivery method of _ Lecture and Hands On Wet Lab. This approval is valid in jurisdictions which AAVSB RACE: however, participants are responsible for ascertaining each board’s CE requirements. The course fee for veterinarians is $400 USD for the didactic session and wet lab. All Health Care Professionals must register and pay a course fee. Cancellations must be received in writing via email to Anna.Czernicki@Arthrex.com. A full refund will be available for cancellations received by November 8, 2019. After that date, no refunds will be made. Contact Anna Czernicki at Anna.Czernicki@Arthrex.com with course related questions. Please remember to include the course date and title in your communication.